Sailing is fun, and having a great tale to tell of how fast you were or what boats you sailed past is also great fun. Fun is valuable. It makes us enjoy life, so hours spent sailing must be fun or they do not provide “value.” Stands to reason if there are more fun things to do with the boat, the cost per hour is reduced (improved value). And no, do not ever do that calculation please. This value proposition was one of several things I had in mind when 20 or so years ago I started really promoting the idea of races with classes for double handed (DH) crews, the first being the 1991 Block Island Race with 18 starters in two classes. One of the main reasons is that since most boats are “cruising” boats, not race boats, having a double handed class was a good way to encourage owners of boats that would not normally “race” to use their boats and have fun without actually going through all the drill that “race boats” do. A DH race dramatically reduces the organizing, logistics and cost of “racing” without diminishing the satisfaction of competing. I am not knocking crewed racing; it’s just that sailing with 7-10 crew is not what most owners do, nor is it the way most cruising boats are equipped. Most owners sail with a couple of people. Look around this Spring and notice how many boats have only a couple of folks aboard. DH racing gives these owners a chance to burn off a bit of that human competitive spirit with the boat and equipment that they have for low cost and effort. Almost all sailboats today have a headsail on a furler and many have an asymmetrical spinnaker, charting software/GPS & displays at the helm, and an autopilot. In my experience, sailors are fascinated by all things to do with their boats and they love to learn about their boats and sailing. DH racing, just like cruising, requires that both crew be capable of doing every task on the boat. Sailing with less crew requires a different approach to everything. It requires a much more developed sense of “what is going to happen next” – as good a definition of seamanship as any. If something goes awry aboard a 40-footer with ten or twelve crew aboard, it is a lot easier to rectify than if the same thing happens with only two or three aboard. Several years ago, I interviewed Rich du Moulin and Peter Rugg after their victory in the Newport Bermuda Race double handed class aboard du Moulin’s Express 37 Lora Ann. I wanted to know how you take a boat from the racy end of the racer/ cruiser spectrum usually sailed by 10 crew and make it easy for only two guys to race in the ocean. Turns out it was all the stuff the average “cruising” boat has: a good autopilot, sail handling systems to make it easy and safe for one person to change sails, good navigation equipment (and the smarts and experience to use it). Rich and Peter developed suitable systems for cooking, eating and sleeping, and for managing the eight “Panic Button” events on a boat at sea: broken mast, MOB, damaged hull, damaged steering or loss of rudder, medical emergency, a hole in the boat, and abandon ship routines. Furthermore, most of the boats that enter the (everexpanding) number of races that offer DH classes are all “normal” boats – production cruiser/racers sailed by normal Corinthian sailors. A scan of the entry list for any of the 23 DH races in the Northeast reveals a collection of pretty normal boats. Australian born, Joe ‘Coop’ Cooper stayed in the US after the 1980 America’s Cup where he was the boat captain and sailed as Grinder/ Sewer-man on Australia. His whole career has focused on sailing, especially the short-handed aspects of it. 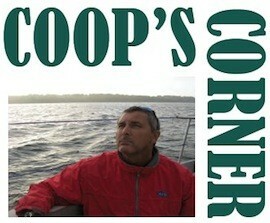 He lives in Middletown, RI where he coaches, consults and writes on his blog, joecoopersailing. com, when not paying attention to his wife, teenage son, dog, two cats and several, mainly small, boats.